I've been meaning to get this swatch posted for ages...since I bought it actually! Shame on me! 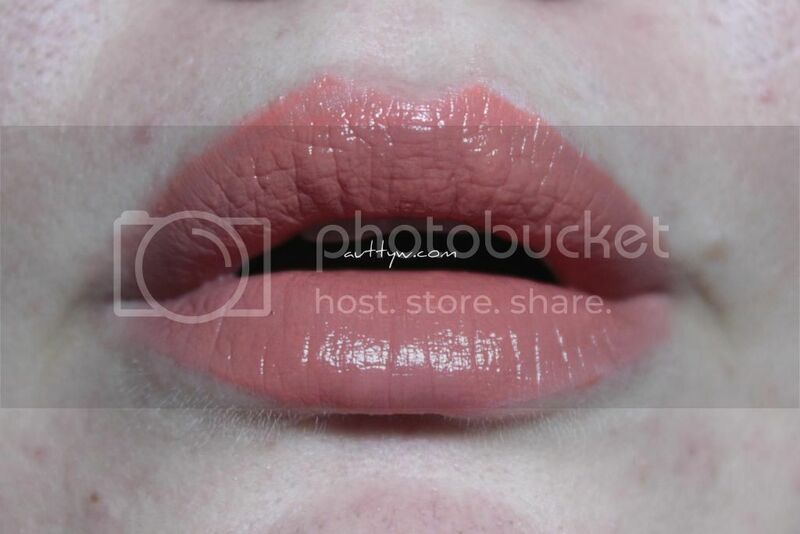 The Glazed Lip Paints are LA Girl's version of OCC's lip tar. The product itself is highly pigmented and it is a good alternative to lip tars. Albeit cheaper I don't think that these could totally repalce my lip tars at all. The formulation of this is nice. It's creamy, pigmented and applied nicely. I found this thicker than the lip tars I have and it reminded me of a liquid lipstick more then anything. As per the packaging I have to say, I am not a fan. It's not easy to apply straight out of the tube. It's one of those squeezy lip gloss tubes and it just makes a total mess of things. I definitely suggest using a lip brush if you're able too. If not you're going to have a hot mess on your hands. I wish I had these local, I'm definitely a person who likes to see before I buy. LOL! I do like how this looks on you! What a nice lip color on you. I like how wearable it is too. it is a great color on you, Autumn! Sometimes it's hard for me to guess if a color online is going to look great on me or not. Thank you so much! I just kind of wing it! That's probably why I don't have a wide range of colors. Thank you! I'm quite pleased on it's wearability!